I am sad about leaving my work of the last 23.5 years, of course, but I am excited to move forward. I made this choice, and I own it, gladly, even knowing I will soon be unemployed for the first time since 1990 or so, but “forward” and “choice” and “gladly” are the key words here. Of course, it’s not all a bed of roses. There is worry and, yes, fear, involved in this step. And there are so many details! I’ve seen all my doctors and filled my prescriptions; I’ve found and purchased an appropriate health plan going forward (NYS makes it really easy, thank goodness); I’m taking full advantage of various services of The Actors’ Fund (my favorite helping hand for entertainment professionals); and I have made plans. Lots and lots and lots of plans – some involving my job search, and some personal goals for which I will finally have the time. Yay for de-cluttering! It’s surprising to me that many of my friends are (kindly and generously) calling me “brave”, because really what I feel is reckless. Really, really, really reckless. But I’ve written before about my decision-making process (well, more than once, but that’s a good one), so maybe you understand. And already there have been both ups and downs – help from the most unexpected sources, and a surprising lack of anything from some “expected” sources. It’s been a learning experience, that’s for sure. All that said, it’s time. Time for me to take this step. Time for me to be about me. Yes, again. This year, I marched in New York, but I didn’t actually march. I joined others in forming a wall. What, you say? In standing in solidarity against any actions that threaten civil and human rights. That xenophobia, Islamophobia, racism, sexism, anti-Semitism, homophobia, and bigotry have no place in the White House or in society. That people with disabilities’ rights are human rights. That LGBTQ+ peoples’ rights are human rights. That indigenous peoples’ rights are human rights. That immigrants’ rights are human rights. That environmental rights are human rights. And we know: We are indivisible. One nation, one for all. Every life and every voice are equal. 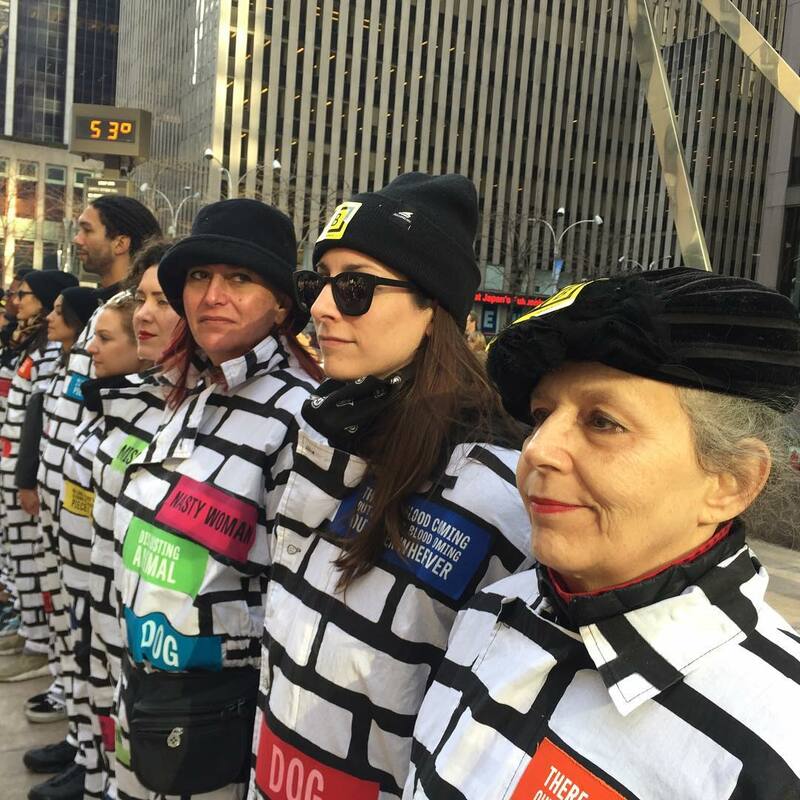 We wore jumpsuits marked with bricks that repeated the vile things 45 has said about women. We stood, silently and hand in hand, for over two hours, as the marchers passed by. They cheered. They took pictures and video. But mostly, they felt the power of taking the idea of the wall and making it our own. I cried. Most of us did. The sense of solidarity, of commitment, of togetherness, reinforced my belief that if we continue to persist and resist, we can save America from this administration.